Pages: 162. Price: Rs. 195. 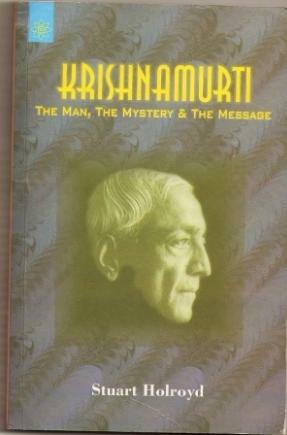 J Krishnamurti was and is still an enigma. In the land of his birth, India and the city, where he had learnt the Three Rs – Chennai, his name rings bells only for a few today. Even those few, probably, had occasions for some association with Adayar, home to the headquarters of Theosophical Society of India, or had their education in the schools and colleges run by the Theosophists. So, it is really strange, and, indeed, unbelievable that in early part of the 20th century, a dim-witted 14-year-old boy from an impoverished Andhra Brahmin family was viewed as the new Messiah, the Vehicle of Lord Maitreya. And how, instead of accepting his new status as the World Teacher, and spiritual guru, he astounded his followers that he was neither. Whenever God came into the discussion, his tendency was to offer a quip or a shrug and quickly move on to the next subject. Because, in his view, God as a concept, an idea, or ideal has been responsible for ‘too much of mankind’s misdirected activity’. Stuart Holroyd offers a fascinating view of Krishnamurti in this book, which is truly a labour of love. Simple in style it makes racy reading even for one who is not initiated into matters religion and philosophy. In a way, Stuart can be said to have adopted himself perfectly to Krishnamurti’s style of engaging his audience in a dialogue rather than address them. The author makes no pretensions of making a critical evaluation of the Man and the Message. But he doesn’t try to be a camp follower either. Here in lies the strength of the book as it takes the reader through various phases of Krishnamurti’s life and his ‘original’ ideas on subjects such as freedom, truth, fear, death and purpose of life. Revolution is a key term in Krishnamurti’s philosophy. What people generally call revolution, he argued, is merely modified continuity, however much blood is shed and suffering undergone in the cause of it. Revolutions involving changes in political systems or based on religious beliefs and dogmas inevitably fail. Yet he believed that a revolution is not only essential but also possible. Explaining this seemingly contradictory stand, the author writes: “He (Krishnamurti) did not minimize the problem. Indeed, he maintained ‘our problems- social, environmental, political, religious – are so complex that we can only solve them by being simple…. These problems demand a new approach; and they can be so approached only when we are simple, inwardly really simple’. This simplicity is not simple –mindedness or stupidity, but the ridding the mind of all the ideas and so-called knowledge that block the direct perception and experience of reality (Page 101). Elaborating the theme, Krishnamurti once said: ‘Our social structure is very intellectual. We are cultivating the intellect at the expense of every other factor of our being and therefore we are suffocating with idea”. ‘Our social structure is very intellectual. We are cultivating the intellect at the expense of every other factor of our being and therefore we are suffocating with idea’. In the early 1950s, he gave three reasons for the crisis in the world (at that time). One world conflicts were not over territorial or economic issues but were over ideas, and ideologues were the most ruthless murderers who would make or demand any sacrifice in the cause of their chimerical ideal. Two man and value of human life had ceased to be important to world political leaders. Third importance that man was giving to material values and particularistic loyalties for such a mental attitude was at the basis of human violence and hatred. Saying that these circumstances constituted an unprecedented crisis, he opined that the situation demanded an unprecedented solution, which brings about a fundamental change in the human mind and nature. How relevant the reasoning is even after the Ganga has seen so many floods. Philosophy, to him, is love of truth, not words, or ideas, and you have to find out for yourself where the reality is. Krishnamurti has made a devastating critique of religion in its conventional forms and concepts. He has also been critical of believers, worshippers, ecstatics, and enthusiasts. Yet, he was, according to Stuart Holroyd, clearly a modern mainstream figure in the venerable Indian tradition of the holy man and teacher. “No matter that he repudiated any following as well as the role of guru, adopting Western modes of casual dress and occasional, vernacular turns of speech, he was, nevertheless, what all but the most bigoted sectarian would regard as a religious man” (Page 87). Says the author that for Jiddu Krishnamurti being religious implies dedication, if not devotion, an intense dedication to investigating what is truth. Put differently, “The search for truth is true religion, and the man who is seeking truth is the only religious man”. To the age-old question, what man must do to attain enlightenment, his reply was: there is nothing he can do (Page 90). On one occasion Krishnamurti said that religious spirit has nothing to do with genius. This was true of his persona. World Teacher, he was but he loved world’s comforts of life – taste for quality cars, suits specially tailored at Savile Row, adventures, thriller movies and even golf. All tastes the puritanical consider inappropriate in a spiritual guru. The brain is programmed (like a computer) but the mind is not. So long as the brain keeps running on its own, like a computer, it operations are ultimately meaningless, notwithstanding their practical uses and applications. If there is no interaction between the brain and the mind, and we just let the brain keep on running things, we are doomed. So, as the author remarks, unequivocally, at the end, Krishnamurti seemed to confess an awareness of his uniqueness, despite the fact that he had often said that if something is unique, it is meaningless. This entry was posted in Book Review, News and tagged Adayar, conflicts, god, Krishnamurti, meditation, mind, philosophy, revolution, Stuart Holroyd, Theosophical Society, Theosophy. Bookmark the permalink. Continue to keep the best level and tell us more useful information.Thanks. That post is incredibly dull. Life goes on.